There's nothing cosier than an oversized jumper! Smartened up with a shirt and boots, it's definitely wearable for work too. I love the gold jewellery accessories too! Even though this winter can be pretty cold, I do love wearing dresses and skirts. Just throw on a pair of thick tights (and I'm talking Primark Super Cosy Tights too) and some boots for the ultimate warm outfit! I honestly wished I looked this good in a hat! And sunglasses for that matter. Big cosy scarves are my addiction, especially tartan ones but I feel that owning more than one is totally acceptable! 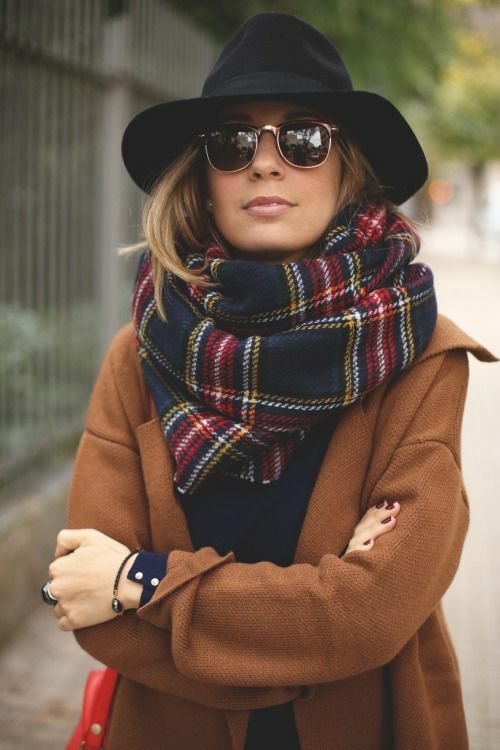 Following on from my big scarf obsession, I'd love to be able to pull off this kind of look! With just a pair of knee high boots and a belt, it stops the scarf from overwhelming and actually makes it into a great outfit. Shirts underneath dresses are my favourite way to re-spin a dress for work. All you need is a good fitting white shirt and your favouirte dress! Add a belt or statement necklace and you're good to go. What do you do when you're in a styling rut? Do you like Pinterest too? Online Privacy: Does it exist?